Getting around in Amsterdam. Photo: Jonathan Maus. 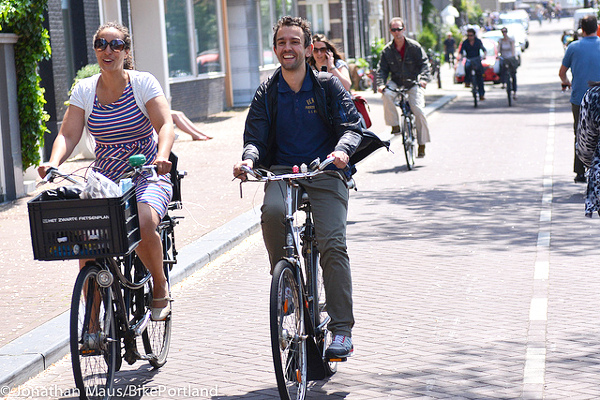 When it comes to making the bike a safe and comfortable choice for everyday transportation, no place on the planet has had more success than the Netherlands. There are a lot of reasons why the Dutch are world leaders in getting people on bikes for everyday trips. The history, cultural context and political decisions that led to bicycling being a rational and mainstream mode of transport in the Netherlands offer many relevant lessons for American cities, and the Green Lane Project is helping to share those lessons. In my opinion, the biggest reasons for Dutch success are physical. The land use arrangement of cities creates short trip distances ideally suited to bicycling. The terrain is relatively flat. And the continuity of the network and design choices on the street makes a trip by bike a very inviting, safe choice. Riding a bike is a perfectly rational way to get around. It’s not riding a bike for short trips that doesn’t make sense. And here’s the best part: it’s not that complicated. While Dutch traffic engineering is among the most nuanced in the world, the core ingredients of the bicycling network are quite simple (and replicable). Raised threshold crossing — Present when turning off of a higher-speed road to a 30 km (about 19 mph) zone. This and other traffic calming measures like speed humps ensure slow automobile speeds and indicate a transition from busy street into a neighborhood. Color, texture and grade differences are sometimes used to further reinforce the change. Permeability for bikes — These streets usually provide local access only for residents in cars, but often provide a direct, convenient route to another part of the city for people on bikes. Cars and bikes share the road — No special infrastructure for bikes is necessary because speeds are very low and car traffic is light. This keeps things simple and inexpensive to maintain. Physical separation — People in cars, on bikes and walking all have defined space, created with buffers such as curbs, planters, parking or bollards. 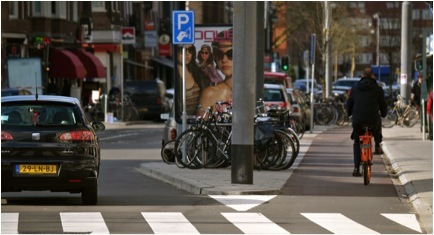 Sophisticated intersection designs — Intersections are the most critical points for safety, and Dutch engineers use bike-only signals, roundabouts, pavement markings and other techniques to provide clear and safe directions to all users to minimize the potential for conflict. Right turns on red are prohibited. In the U.S., people on bikes and on foot are often mixed (along with strollers, rollerbladers, pogo-stick riders and every other form of non-motorized movement) on multi-use paths. 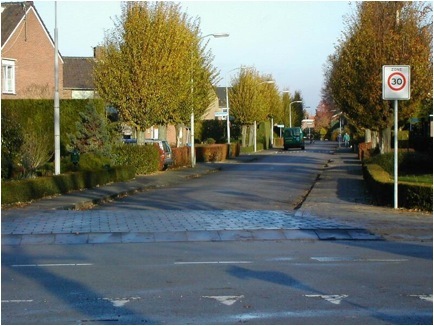 In the Netherlands this is rarely the case; bikes and pedestrians are provided distinct, separate space. Complete separation — Paths are fully separated from car traffic. 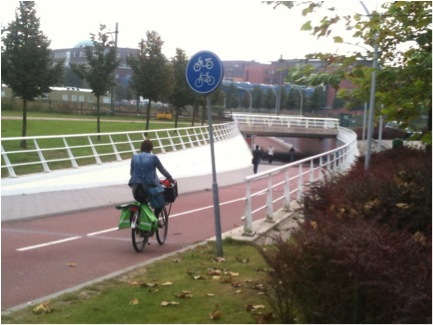 Continuous and fast — Whenever possible, designs allow people on bikes to continue without stopping by using tunnels, bridges, or roundabouts at intersections. Smooth, wide surfaces — Paths are sufficiently wide to allow side-by-side riding in both directions and safe passing by faster riders. That’s it. There are variations in the details, but 95% of the Dutch network looks like one of these three street types. All three of these facility types are part of the family of low-stress infrastructure we call green lane networks. And all three exist today in the toolbox of American cities, ready to be used. The Green Lane Project assembles policymakers, transportation professionals, and senior city staff from the six focus cities to study, experience, and be inspired by the most advanced bicycling environments in Europe and North America. In 2012 delegations from Austin, Memphis, and Washington D.C. visited the Netherlands as part of a Green Lane Project study tour.